So as I said in my cruise entry, while in Nassau I wanted to do a Saturday morning dive without missing our afternoon snorkeling excursion — which left me a four hour window after docking. 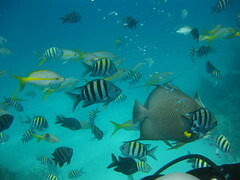 I called Paradise Dive Charters, Stuart Cove, and Bahama Divers to check their dive schedules: Stuart Cove couldn’t accommodate my schedule, Paradise had a “discover” (entry-level) dive, but Bahama Divers had two morning dives that fit my needs perfectly — as long as I could get to the dive center within ten minutes of docking time. This was doable by taxi — though as mentioned a bribe was needed to grease the wheels a bit. 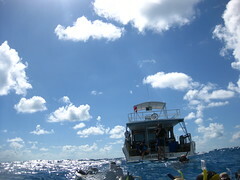 From Nassau it was about a 45 minute ride across choppy waters to Lost Blue Hole, possibly named for the difficulty finding any nearby landmarks with which to mark its mostly nondescript location, some miles east of New Providence Island. After entry we descended about 50 feet to a flat sandy field, in the middle of which was the Blue Hole itself, a cavernous tunnel about 80 feet wide, going straight down to over 200 feet, its bottom well beyond the visibility of the water that day. 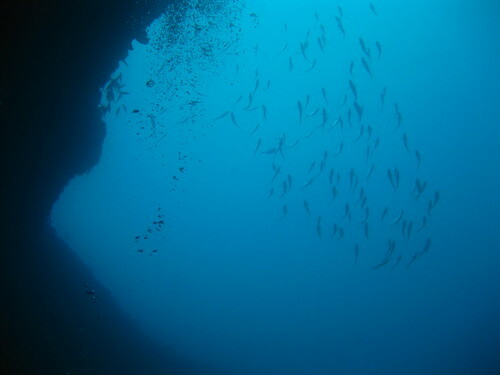 The water got darker and colder the deeper into the hole I went, but I saw much more life — fish and coral — along the walls than amidst the featureless sand above. Circling the void at the center of the Hole there were dozens of sharks, small to medium sized. 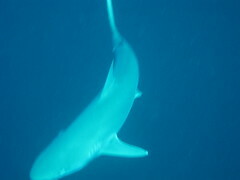 There was no danger; we had been specifically warned by the divemaster to stick to the wall and not venture into the center of the Hole — not for our safety, but to avoid scaring the sharks away. Nonetheless the sharks themselves were somewhat curious and cheeky, swimming close to check me out before deciding I was too large and unappetizing.  A giant leatherback sea turtle made an appearance, though I saw it only briefly as it burst out from the coral and retreated to the depths, a single remora hanging on to the back of its shell. 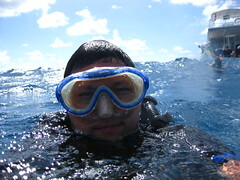 The dive shop cameraman managed to chase the turtle down past 100 feet, but I wasn’t feeling quite as bold. 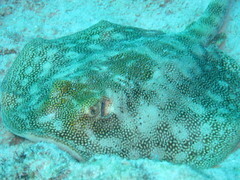 We also spotted a young stingray nestling in the sand just outside the hole as we were ascending back out. Cute thing. 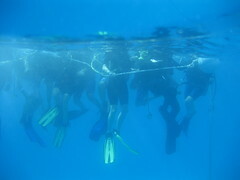 Despite its name I saw no barracudas at the next dive site. 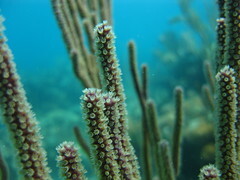 Most of the sea life was unremarkable; just the standard coral and small to medium sized fish. 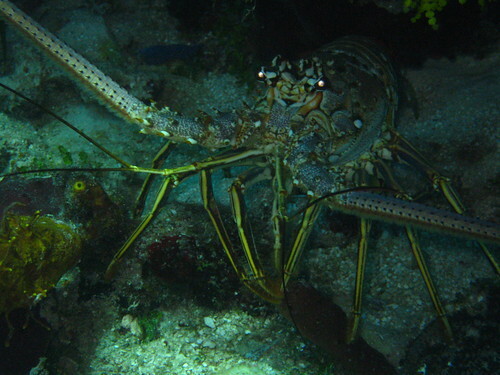 Near the end of the dive, however, we did see a very, very large lobster sitting immobile under a rock. 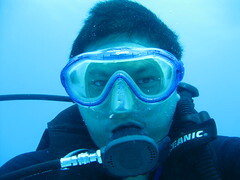 I also very nearly lost my camera, when the strap slipped off my wetsuit without my noticing. When I realized it was no longer on my arm I frantically searched the reef for about two minutes before I remembered that the camera housing floats. Sure enough, when I turned my eyes up there was the camera floating just above me. This was a shallow reef (about 20 feet) so a brief surfacing to retrieve the camera was not too disruptive to my dive profile. Post-dive, the dive shop offered a tape of dive video taken that morning — set to bad reggae covers of pop songs. I opted out, though I wish now I hadn’t: the video of the leatherback turtle at Lost Blue Hole was quite a sight. One final note: they gave me a ride back to the cruise ship pier, which I appreciated greatly, especially since I could chat even more with the divemaster. An excellent morning of diving, and I got back to the ship with time to have lunch with Amy before heading out again to go snorkeling.